So there’s no time like the present to take action to improve email deliverability. Here are 17 things you can do to increase the likelihood that your email message will get into your recipients’ inboxes, where hopefully they will open, click, and engage with you and your brand. Use double opt-in. Double opt-in is compliant with laws like CASL and CAN SPAM. It generally requires that the recipient click on an activation email that you send. It can also set up a pattern of engagement. Make your from and subject line explicitly you and true to the message. If the message is not “from” your brand, it should be from a person at your brand. The subject line should also clearly reflect the content of the message. Segment your list. All your recipients are not alike. Segmenting your list by interest and modifying frequency accordingly can drive more engagement. Implement Sender Policy Framework. By using SPF, you provide ISPs with the assurance you are who you say you are, making them more likely to deliver your message to the inbox. Prune your list. When it comes to your email list, more is not always better. If the recipient hasn’t engaged with you in 6 months, target them with a special message and if that doesn’t drive engagement, remove them from your list. Let someone help you avoid bouncing. Hard bounces should be removed from your list. 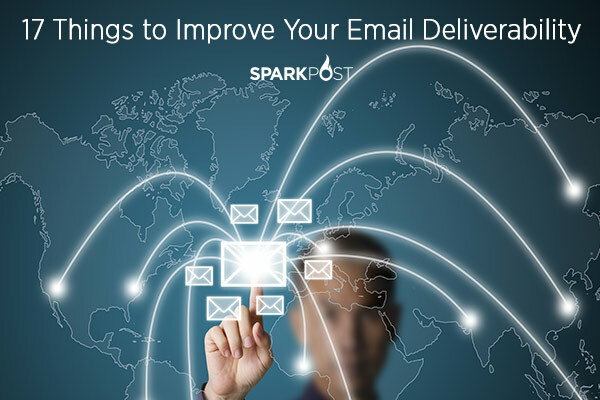 At SparkPost, we add those to your suppression list right away so you don’t see more bounces, but it’s still up to you to remove those addresses from your list. Watch out for spam traps. Spam traps are emails created by ISPs to find spammers. Check your reputation. One tool you can use is Sender Score to find out where you stand with respect to your sending reputation. Don’t add emails from contests and giveaways. You’ll probably get multiple signups from the same email address. If you do these types of promotions, make sure you vet the resulting emails carefully before adding them to your list. Check blacklists. Make sure your organization isn’t on a list that automatically sends your emails into a black hole instead of the inbox. Consider the source. Where did you get that email address? Some sources are much more reliable than others. As a general rule, buying lists is a bad idea. Make unsubscribing very easy. If unsubscribing is difficult, in frustration, recipients may mark your email as spam as a way to stop receiving your email. If recipients cry spam, ISPs listen and you can quickly land on a blacklist. Register for feedback loops (where you can). How can you find out if a recipient is marking your email as spam? By subscribing to relevant feedback loop reports from ISPs. One notable exception is Gmail, which only sends feedback loop reports to email service providers. What’s the frequency? Pay attention to how frequently you are sending email and what kind of responses you get. Send email too often and you risk being ignored (or deleted without opening, which harms deliverability). Send too infrequently and recipients may forget about you. It’s a balancing act. Keep frequency consistent. Once you settle on a frequency, stick with it. Erratic sending patterns are considered a marker of spam. Study your metrics. Real-time analytics are the best way to drive your email marketing strategy. SparkPost offers numerous real-time reports and webhooks that you can leverage to drive engagement and improve deliverability. Pay attention to clicks and opens. If you’re having trouble with blacklisting, SparkPost can often work with you to help you get removed from those lists. Work to improve your open rate. Deliverability is clearly important, but it’s not the end game. You want to drive engagement, to have recipients open and click on your email. That happens with engaging content, a subject line that tantalizes followed by summary text that draws them in further. Email marketing goes beyond clicks, open and bounce rates. This blog takes a deeper dive into which email metrics you should be tracking to get the best ROI.